First off, let me apologize if a lot of you know about this variant already. But, I have come across three people who didn’t know about this, so I thought I would throw it up on “Covers from the Unknown”! As we all know, the Dark Knight Returns (Falls) #4 is burning up the bay recently. Sadly (or not so sadly) there are no variants for that comic, and there are really not a lot of cover swipes for that also. But here is one modern that fits the bill! 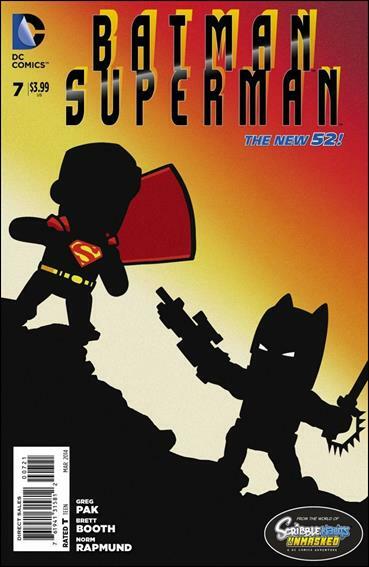 I give you Batman Superman #7 (New 52), the 1:25 Scribblenauts variant by John Katz. The regular print of Batman Superman 7 had a print run of approximately 56,000. Being a 1:25 variant, that means there are only about 2,300 of these out there. With all the hype of the movie, and the iconic comic cover swipe that it is, that number does not seem like a very big number to feed the masses. There are 8 of these on the bay right now, all with a BIN of under $20. My thinking is these just might catch on, and pick up a little steam. Heck, look what the Killing Joke is doing to all those covers! Go get this now my friends. I think it only goes up from here. I had no idea and thanks for the insight. I think this is definitely one to watch. I’m getting a copy for the PC.